Surf Boards : We have a wide range of SSR Alder surf boards from 6ft to 9ft foam boards for beginners to suit all shapes and sizes. We also use Torq hard boards from 6ft up to 9ft in a variety of shape and size! 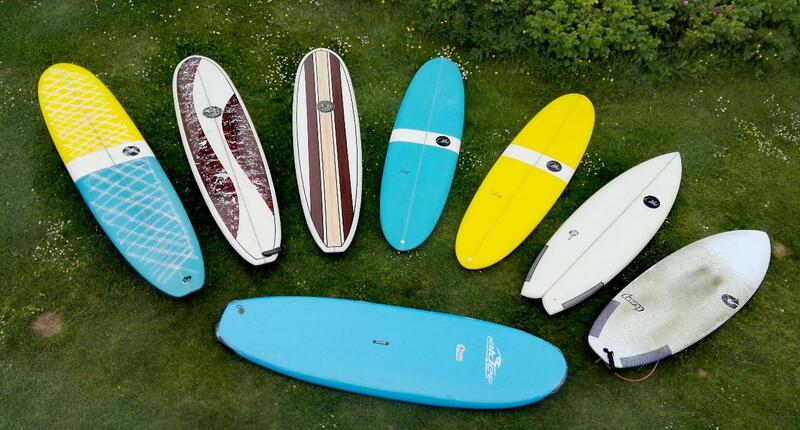 Bodyboards : We use Alder Psycho and Alder Assassin - great boards for bodyboard rental in small to medium surf! Wetsuits : All our wetsuits are 5mm and we use two brands Evo Fire Alder wetsuits for all year round Scottish use and C-skins wetsuits too. Our accessories are also high quality, with boots, hoods and mitts included in the price depending on water temperatures to keep you warm in the water year round. Basic water temps : Wetsuit only June-September. Wetsuit and boots May, October. Wetsuit, boots, hood and mitt November to April. All hires last two hours, we ask that you have had at least one lesson and can swim 50m minimum. For all Under 16's there must be parental supervision. to ensure safety in the water. We will provide kit that is suited to both the conditions on the day and your standard of surfing. Please note we take id deposits for the hire period and all surfers planning to surf unbroken waves should understand wave etiquette and rips. Hires take place at Belhaven beach through the season. Hire to other locations can only be done by arrangement in advance. All our equipment is given in good condition. Should you damage our equipment, we reserve the right to charge the value of fixing or replacing the equipment at trade cost.